Flow Kimonos is a Boston based gear manufacturer that was created last year by Jonathan Leung. I stumbled across Flow Kimonos while searching thru Facebook for new gear manufacturers and after seeing some of their pictures and sizing chart (they have slim/tall cuts) I contacted them about a review. Fast forward 3 months. I’ve been training in their prototype unbleached hemp gi since mid-December and in that time it has become one of my favorite gis and a staple of my training. Flow Kimono’s hemp gi is manufactured in China and they are transitioning their other gis, the Pro Series White & Black, to China as well. The Navy Blue Hemp gi (production version of my prototype) is available for pre-order and should be available in late-April or early May. This jacket and pants of this gi are constructed of 100% hemp and are manufactured in China. I’ve reviewed a handful of gis from China (Datsusara and Lucky Gi) and as a group the overall quality is better than what I’ve typically seen out of Pakistan. The gi is unbleached with green contrast stitching used throughout. 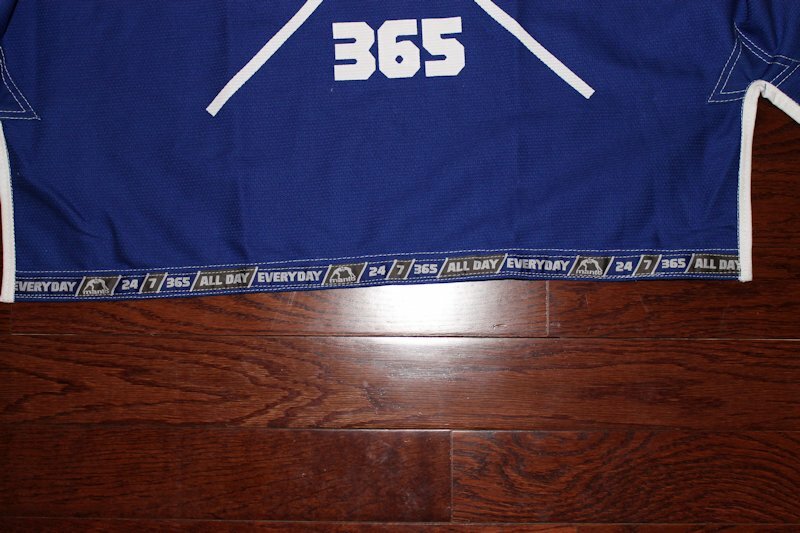 The stitching is consistently even and well-done. The collar is unique in my gi collection in that it has a very rubbery texture that is quite a bit different than my other gis. This is especially noticeable since the jacket material is very similar to a single weave for softness and pliability. The armpits and side slits are reinforced with green patches of extra material and stitching. The pants have 3 sets of double loops and a flat green drawstring. There is reinforcement at the knees that starts at mid-thigh and continues down to about 10 inches from the cuff. The stress points of the pants have all been reinforced as have the slit slits. Right out of the package I really liked the aesthetics of this gi. I like the natural look of unbleached gi and the minimalist approach to bling focuses your attention on the gi itself (and gives you room to put your own on if you’d like). 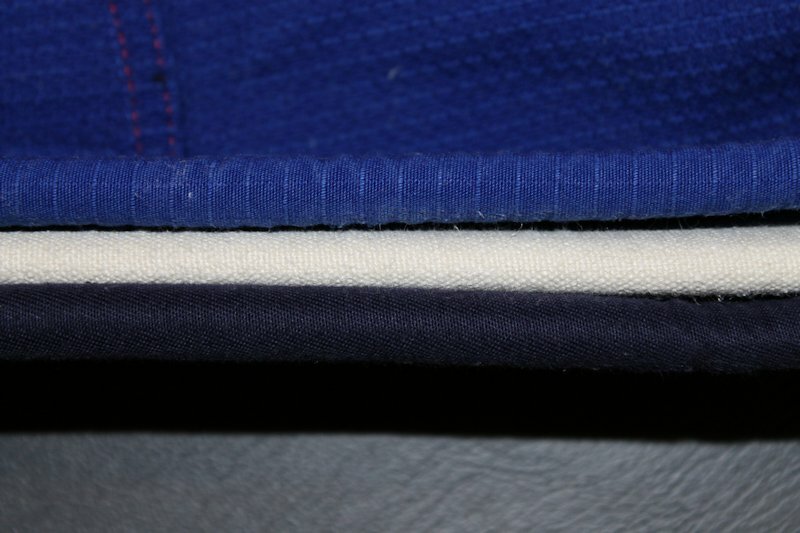 The gi has identical embroidered patches on each shoulder. The embroidery is a 2.75” circle with “flow kimonos” underneath, flow is in yellow and kimonos in green. “flow kimonos HEMP SERIES” is embroidered on the bottom left of the front skirt. In all cases the embroidery is very well done and is not removable. The only other decoration is the small manufacturer ID patch that is on the bottom of all lapels. The side slits are trimmed in green and the same color is used on the inside of the skirt and cuffs. The gi pants feel like 12oz drill cotton and are also 100% hemp. They have green contrast stitching and extra reinforcement at stress points. Keeping the same simplicity as the jacket the pants have a patch on each outer upper thigh and then “flow kimonos HEMP SERIES” embroidered near the bottom of the left leg. The patches are identical and are 1.75” x 7.5”. The patches are satin and single stitched so that removal is straightforward if needed. The final patch is a small 2.5” x 1.375” black patch with the manufacturers name on it. The flat drawstring is a little annoying but functional and I wish the knee pads went down to the cuff. The gi fit me right out of the bag and was long enough that I was able to dry the jacket once to tighten it up a little bit. Since getting this gi it has become a part of my normal rotation and I wear it to every other gi class. The jacket feels a lot like a single weave and the collar, while not particularly thick, is very stiff. The arms and chest of the jacket are definitely cut for slimmer athletes. Some companies just add a few inches onto the wingspan and call it a long. Flow’s sleeves are noticeably slimmer and the minimal overlap of the chest keeps the excess gi material to a bare minimum. The jacket is about as warm as a crystal weave and works very well in the winter. The only thing I didn’t like was the drawstring. I’ve had several people ask me about opponents gripping the gi and also the weight. I don’t have a scale but the gi is noticeable lighter than my other hemp gi (Datsuara) and probably weighs about the same as a 450g pearl weave. For grips, it’s a lot like a single weave and that’s the trade off that you have when your gi is soft and comfy. 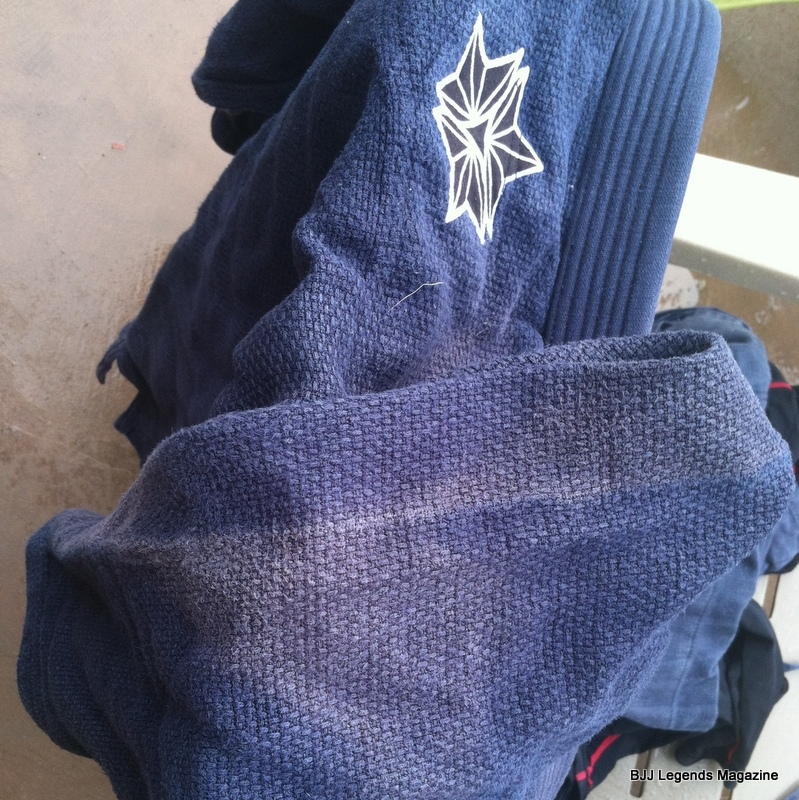 Editor’s Note: I’d caution anyone that uses Oxiclean with unbleached or blue gis. I put the detergent directly onto the pants of the gi and didn’t immediately fill up my washer with water and the detergent took some of the color out of the pants. This has happened one other time with a blue gi (not hemp). Flow Kimonos is another great new gi company. It’s exciting to me that in the last year or so dozens of great new companies have popped up to give the big guys a little competition. Flow’s distinction is that they’re using hemp in some of their gis, will soon be offering Chinese construction and their sizing options will appeal to competitors of all sizes. The production model is Navy Blue ($179.99) and will be available in mid-April. The cut & design is the same as the one that I have with the exception that the flat-drawstring will be replaced with a cord. Flow’s kimono is priced competitively with Datsusara’s hemp gi and would be a great option for those that want a hemp gi and would like a cut that is more consistent with other BJJ kimonos. Be sure to keep up with all the latest and greatest from Flow Kimonos by checking out their website, Facebook and Twitter.